We will tell you all you need to know about running a successful vet clinic with high profits. The most important skill to level up is the vet skill. If you need to hire an employee always choose the one with the highest vet skill. Other important skills are the handiness skill and the charisma skill. Below I’ll explain how skills affect your employees and the vet clinic. 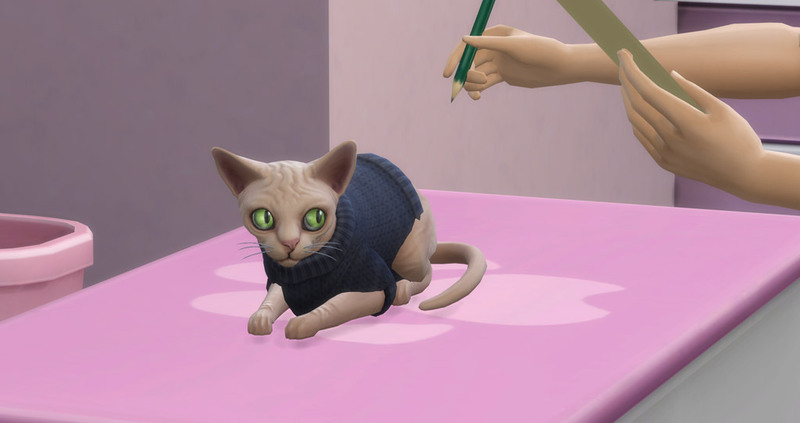 The level of your vet skill determine how capable your Sims is of treating pets at the clinic. It will affect how quicky and effective they treat pets and the ratings that customers will give them. The handiness skill is used to fix machines that malfunction. If you level this skill it will be quicker to fix things and less likely to electrocute your Sim. You can also do important upgrades to your machines with a higher level handiness skill. Charisma is important how your Sim will greet people in the waiting room. This will affect your vet clinic rating. When you’re ready to buy a clinic, go to the lower right corner and click the venue button. Select the option ‘Buy A Vet Clinic’. You can set up a vet clinic in every world available. 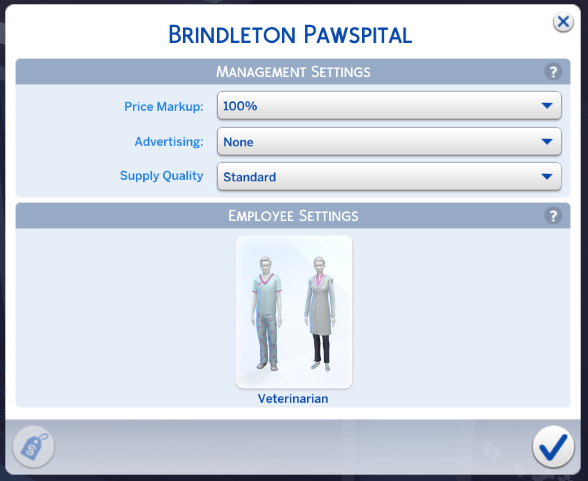 The lot that already has a vet clinic in Brindleton Bay costs §84,111 and is called Brindleton Pawspital. If you’re not really a builder you can buy this lot and make a few adjustments to make it more profitable. You can also tear it down and build your own on this 40×30 lot. The next step is to transfer some of your household funds to your newly bought vet clinic. The more you put into your business, the easier it gets to make it more profitable. With this funds you can hire staff, train staff and make the customers feel more comfortable in a well decorated room. If you want to add or remove money you can always transfer business funds later in the game. Let’s see what we need to build a vet clinic! 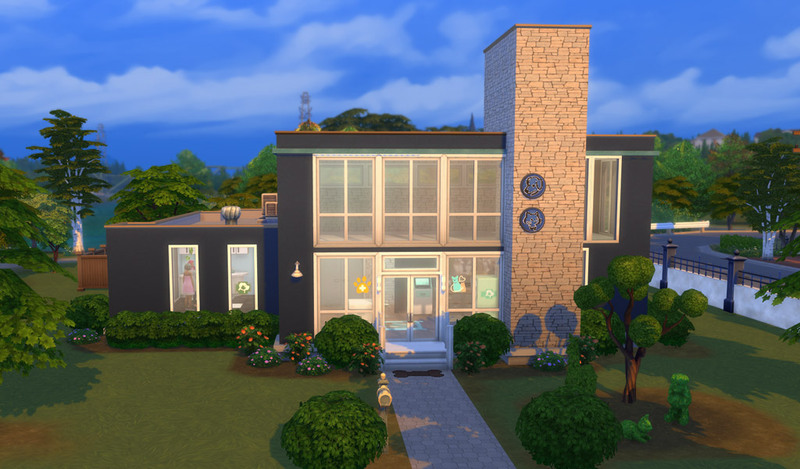 If you’re not a builder you can download one from the gallery or adjust the excising one. You need a waiting room, examine room, office and a surgery room. This is a very important room to decorate because this is the first room customers will walk into. What do you need to add in the waiting room? Close this door to everyone but employees. This will keep pets and customers out of the office. You only need one object in here, decorate the rest the way you like. Don’t forget to entertain your customers a little, add paintings, tv or aquarium in the waiting room. You can hang posters and signs on the front of the Vet Check-In Podium. Use Robot Vacuum Cleaners to clean your Vet Clinic. This is very useful because you can just click on the roomba and it will starting to clean for you. Upgrade it with the Waterproof Mechanisms. You now have a functional vet clinic you can start with. First you need to do one important thing before you start. Lock the door of the office for everyone but employees so customers won’t hang out at the computers while waiting. When you go to the lower right corner and click on the venue icon you can view the statistics of your vet clinic. This will tell you how well your vet clinic is doing, if the customers are satisfied, if you’re making profits and you can also buy perk points when you collected enough of them. This is very important when you want to run a successful vet clinic. Each time a customer leaves they’ll give you a star rating. Improve this rating to attract more customers. If you’re curious how to improve your rating you can hover over the the stars to see your growth opportunities. 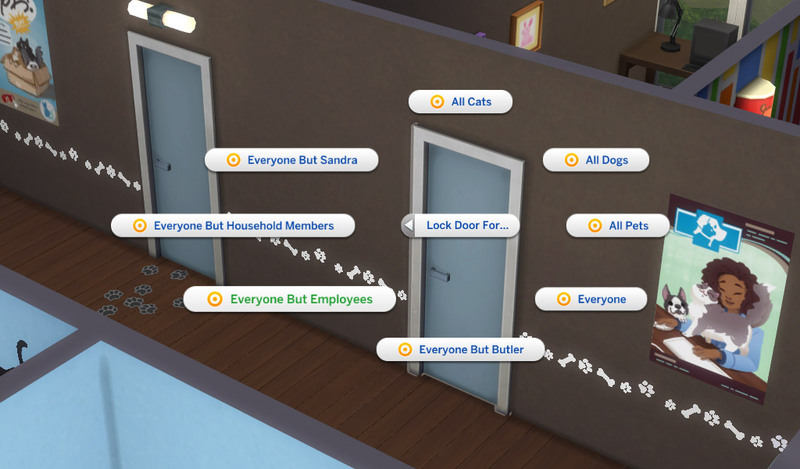 If you go to the Vet Clinic Settings in the Business menu you can change a few things. You can unlock the Supply Quality (this can be unlocked by getting the perk for 500 Perk Points) and choose the outfit for your staff. Determines profit from exams and treatments. High markups need to be paired with high quality of service or customers will review the clinic poorly. Your markup is set to 100% when you first start a vet clinic. You can lower it to 85% or 75% or you can increase it to 150% and even 200% when you can offer the best quality service. Advertising will bring more customers to your Vet Clinic. Be careful, it can get expensive so make sure the money is worth it! Choose between a Gold Package that will cost §240 a day or get the Platinum Package for §480 a day. Good staff members are required to run a successful clinic. You can choose to hire random staff members that are placed in the world and you can also send members from your household to help you out. Household members won’t fill the spot as staff member. Go to your venue button in the lower right corner. You’ll see a picture right to the star rating with a person on it. You can manage your employees when you click on it. When you are just starting out you only have one empty slot to hire an employee. You can unlock additional slots by buying them with Perk Points. 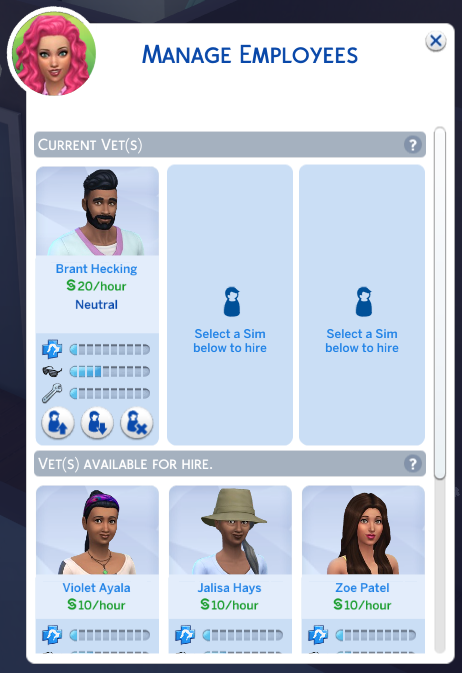 Most of the Sim you can hire don’t have a lot of experience, you can download Sims with a higher vet skill from the gallery and place them into the world. After you did this they will sometimes turn up in the menu to hire them. 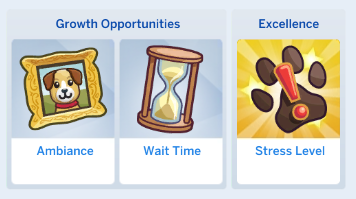 Sims with higher skill levels will cost more each hour so you may want to start out with employees that aren’t very experienced. Employees are really helpful in your vet clinic! So don’t hesitate to hire them when business is getting better and more customers come over. They do require some work to manage them and keep them happy. Depending on how well your employees are doing you can promote them, fire them but also praise them for example. You can use the employees to create serums for the exam table, surgery table or treats to fill up the vending machine. This is very useful to earn money when you start selling treats your staff made. Most employees don’t have maxed out skills so you’ll have to pay for training when you want them to improve at their job. Unlock the ‘Lower Employee Training Costs’ to reduce the cost a little. Click on the employee thumbnail with the outfits to change them. You can pick an existing outfit or you can create a completely new outfit. You can set the outfit for both males and females, give them the same outfit or mix it up a little. You can purchase a new outfit if you unlock the Vet Coat with perk points. Or you can unlock them with cheats. Unlocks the ability to hire one additional Vet within the Manage Employees window. Unlocks the ability to set the quality of vet supplies. This way you can make the vet supplies more expensive or cheaper. Temporarily increases the number of patients who come to your Clinic. Makes pet owners easier to impress with quick service and less likely to get upset at slow service. Unlocks the ability to hire one additional Vet within the Manage Employees window. You’ll need to unlock Additional Vet #1 first before you can unlock this perk. Unlocks the “Inspirational Speech” social interaction, which can be used to inspire your employees. Lowers the cost of training for employees. 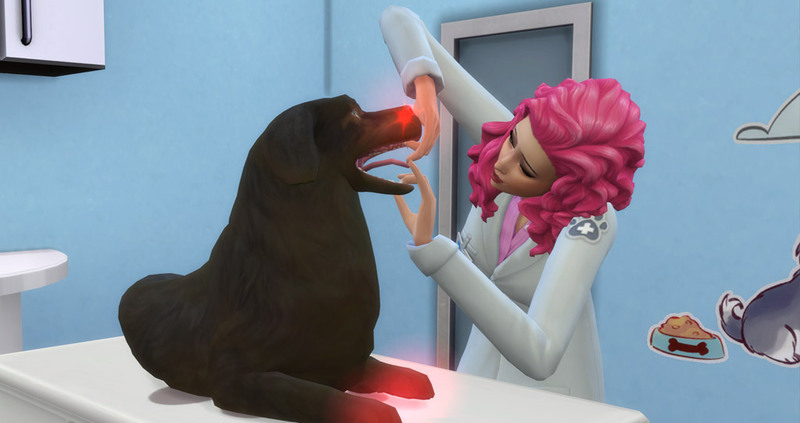 Lowers the chance of bad events happening at the Vet Clinic while your Sim is away. Decreases how quickly pets become stressed during vet procedures. 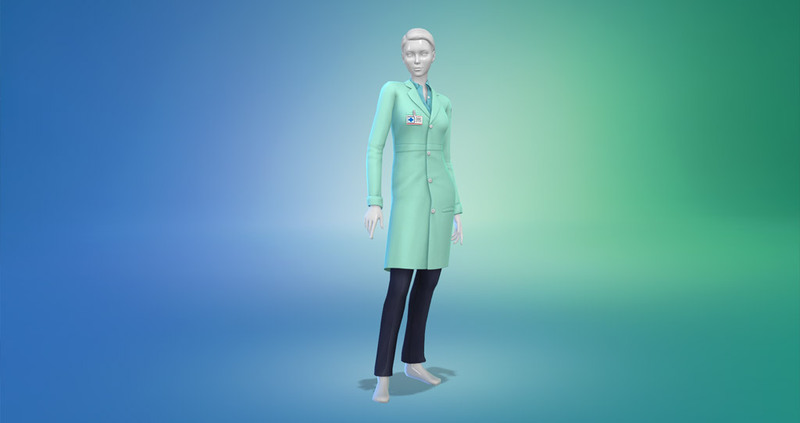 Unlocks a bonus lab coat for your Sims. Now it’s time to receive our first patients and customers. When customers first walk into the clinic they’ll need to check in their sick pet at the Vet Check In Podium. After they checked in their pet they’ll get a star rating above their head. Customers all start with a 3 star rating. Now you need to turn it into a maximum 5 star rating. When you hover over the customer you can see their latest opinion about your vet clinic. For example if it’s well decorated they’ll tell you: “Wow! This is a great-looking Vet Clinic.”. Another thing you can see while hovering over the customer is the pet that belongs to the owner. The pet will get a pop-up with patient above their head when you do this. There’s also a card that is displayed above their head when the patient is checked in, going to the examination room etc. so it’s easy to check what your employees are doing if you aren’t treating that particular patient. Don’t wait too long before you greet a customer or patient. They don’t like to wait and this can decrease the star rating. Improve your charisma skill to unlock new greeting options to get a heads start when you greet them. If you have the option you should go for ‘Greet Patient Warmly’ This will give the pop-up where the owner asks to examine their pet. The sick cat or dog will walk with you to the examine room. When the pet is sitting on the exam table you can start to find out what’s wrong with this pet. The menu to examine the patient will pop up in the upper left corner of your screen. 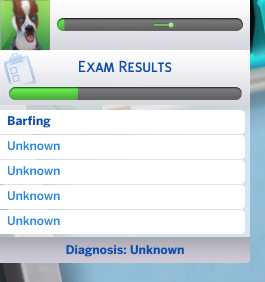 The top bar will tell you the stress level of the pet and the bottom bar will tell you what you discovered about the symptoms so far. Below that you can collect the symptoms to see what treatment is needed. Some diseases have 1 symptom but some diseases have 6 symptoms. You can choose between numerous of options when you click on the pet: Exam, Calm Patient, Treatment, Move to Surgery Station and End Exam. We first need to focus on examine the patient to see what’s wrong with them. There are a lot of options to examine the pet: Examine Mouth, Eye Exam, Listen to Breathing, Listen to Hearth, etc. Check Chart won’t increase the pets’ stress level. Watch the stress level when you’re treating the pet, they’ll get upset when it’s too high and this will instantly build up the stress level without a successful exam. Both cats and dogs can have the same illnesses. The illnesses are always in the same alphabetical order so it’s easy to spot without examine all the symptoms. We’ve made a tool to diagnose your pets without discovering all the symptoms. What to do when the pet is stressed out? Try to keep the stress level at a maximum of 50% of the bar when it’s yellow. If it’s going to dark orange at 75% the owner will show you that there are not happy how you treat their pet. This can lower your rating. You’ll need to calm the pet to reduce its stress level or you can give them an Industrial Strength Relaxation Serum you can create at the Medicine Creation Table that clears out all stress and it prevents giving the pet more stress for some time.If you still want to examine the sick pet you can always check their chart, this won’t stress out the pet. After you narrowed down the symptoms the pet has you can choose a proper treatment. Make sure the pet isn’t stressed out when you give them the treatment. They will decline the treatment when their stress level is way too high. Each treatment costs your clinic Simoleons and this will be subtracted of your business funds. If you don’t narrow down the symptoms you’ll get question marks at each treatment so it will be a gamble if you choose between them. The surgery station is a more powerful version of the exam table. You may need to use this when you advance as a veterinarian. Some diseases can only be treated at the surgery station when you reach a higher rating as a vet. 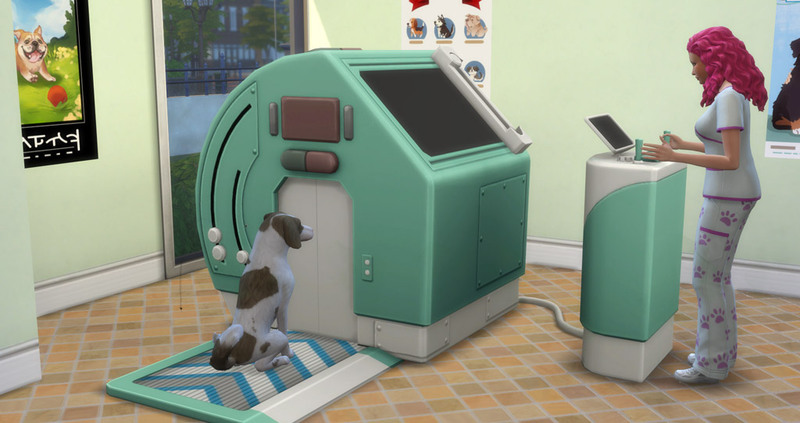 With the surgery station you’ll get a new options to scan the pets and treat them. You can do a Brain Scan, Internal Scan or a Vascular Scan. This gel can be administered using the Surgery Station and boosts Diagnosis and reduces Stress in dogs. This also prevents a bit of stress for the next exams. This agent can be administered using the Surgery Station, and boosts Diagnosis and reduces Stress on cats. After you treat the patient you can walk to the customer with the Simoleon sign (§) above their head and he/she will pay you and you’ll also earn a few Perk Points. When you are completely done with the patient you can click on them and dismiss them. They will now walk back home. You can also take this opportunity to bond some more with your customers. When you received a few customers you can see their feedback when you hover over the stars in your venue menu. You’ll find growth opportunities to work on for a higher rating. For each growth opportunity we’ll explain how you can fix this to get a higher rating. Keep your vet clinic clean. Add plants and decorations with high environment points. If you’re a starting vet you should keep your prices low. You can also level up your staffs skills or your own. Try being more careful when examine a pet, use the calm down option more. Get a higher Vet Skill so patients are more calm. Be more attentive to your patients. Create more station to work at. 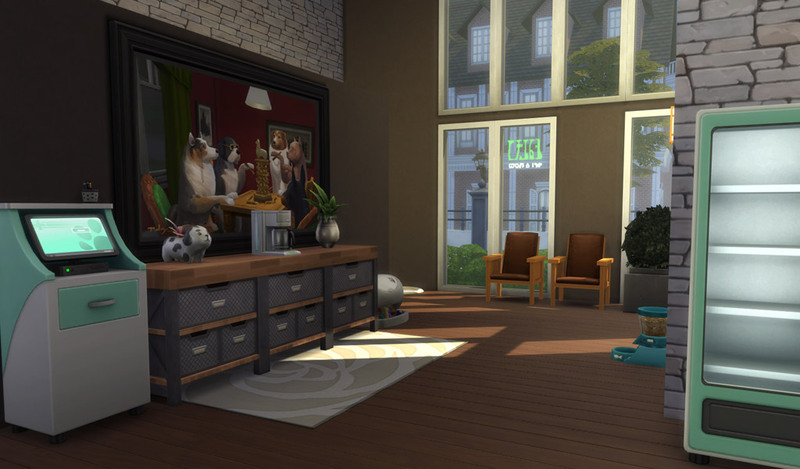 I can give you a few tips on how to earn more Simoleons as a veterinarian. It’s horrible but it’s possible in The Sims. Give random pets Swampwater Taffy treats to make them feel sick. Staff can earn you more money and can help you earn Perk Points. 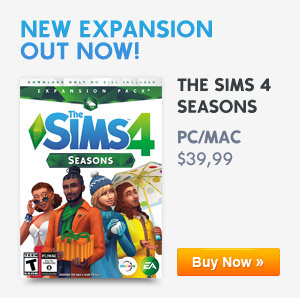 There are 2 new vending machines in this expansion pack. You can stock treats in this vending machine so customers can buy them. Open up the vending machine and drag the treats you made into the vending machine. 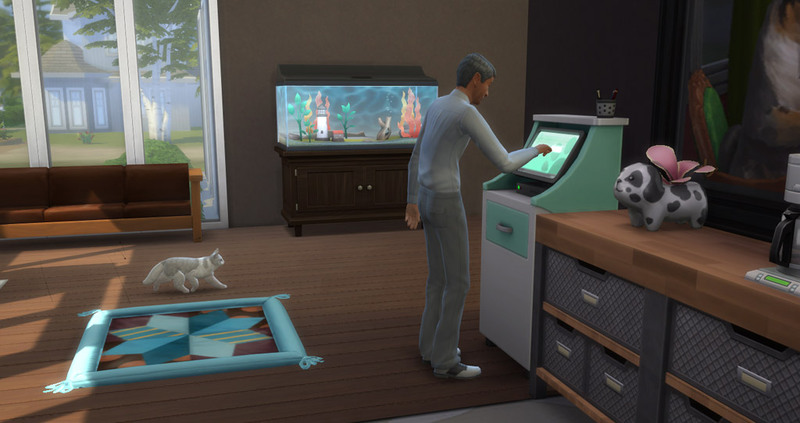 When your Sim is tired you can just close the vet in the business menu to go home. After you close the vet clinic you’ll get a report to see what you earned, what reviews you got from customers and which employee earned skill levels on the job. How do you stock the vet vending machines? Drag the treats from your inventory to the vending machine. You’ll need to make treats first, then open that machine and transfer the treats to your inventory. Then, open the vending machine and transfer the treats from your inventory to the machine. where can i find the open/close sign to let customer know they open or closed? how do you get rid of a vet clinic setting from a house? I accidentally clicked on it when moving to a new house. how do you give your workers a lunch break? they complain after a few hours of working. and say they need a break.